Brian began his musical studies at the age of 9 while at primary school with Paddy Duffy. From an early age he was particularly influenced by the guitar playing of singer songwriter James Taylor and spent most of his youth playing his music. 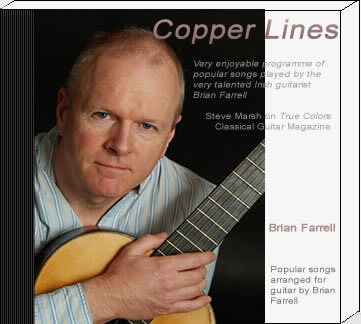 Brian is largely self-taught however, he initially took lessons with the late Barry Lawlor who was undoubtedly one of Ireland’s finest guitar teachers and Barry’s teaching had a profound impact on Brian's career. 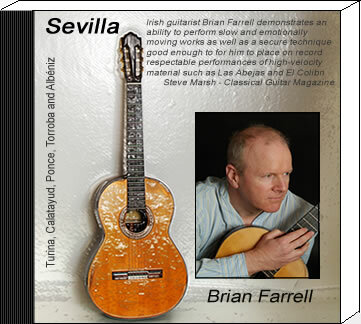 Along his musical journey, Brian on occasion passed through the hands of some of the worlds leading classical guitarists including David Russell, Carlos Bonell, Costas Cotsiolis, Paul Gregory, Vladimír Mikulka. He holds a Licentiate in teaching with the Trinity College of Music London, a Performance and Associate Licentiate diploma along with a BA (Hons) degree and Music Diploma from the Open University. After winning all the major Irish music competitions Brian’s performing career has taken him through many medias such as TV and radio. He has played in many countries as far as Greece, Italy and France with many solo and ensemble performances. 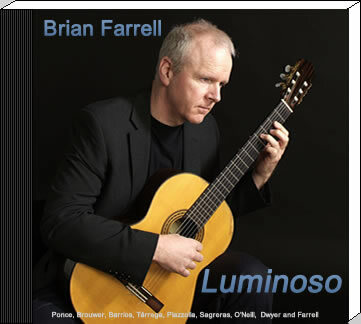 Brian successfully toured with many ensembles such as the Turina Guitar Trio and the Tirando Guitar Quartet giving premières of works written for each group. Scherzo for 3 Guitars (Martin O’Leary), was written for the Turina Guitar Trio and Omeros (Benjamin Dwyer), written for the Tirando Guitar Quartet and was premièred in the National Concert Hall, Dublin, Ireland. Omeros was a special première as the composer Dwyer, joined the quartet for his compositional debut. After teaching in Castleknock College (Ireland), Brian decided to setup his own guitar studio in Castleknock (covering Blanchardstown, Clonsilla & Dublin 15) and 34 years later, is still going strong. Brian is also head of guitar studies at St. Louie Senior School Rathmines, where his love of teaching is thriving. 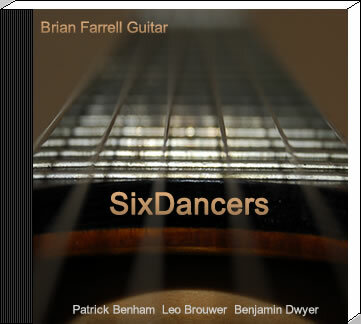 In 2013 Brian worked closely composer Patrick Benham and recorded many of Benham’s major works. These are available on the SixDancers CD. 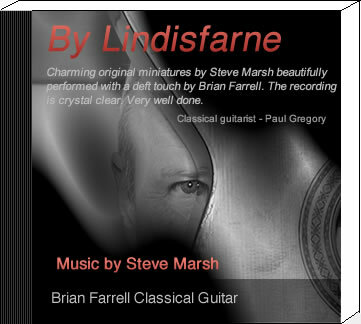 He also collaborated with Steve Marsh in 2015 and entirely dedicated the CD By Lindisfarne to Marsh’s works. 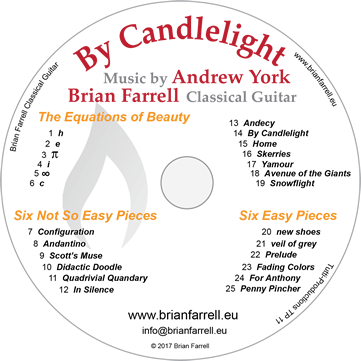 Blair Jackson, editor of Classical Guitar Magazine said, Marsh—and his vessel, Farrell—tap into all these places, evoking a wide variety of moods, from bucolic bliss to quiet contemplation to sweet sadness. The recording is superb and Farrell’s playing sparkles like morning dew throughout. 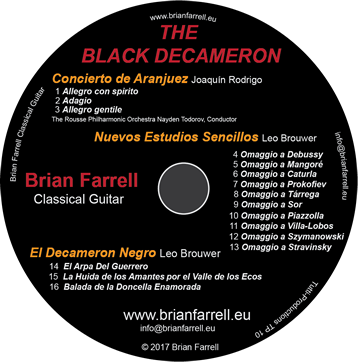 His SixDancers CD also includes the recording of Leo Brouwer’s 20 Études Simples while, The Black Decameron album (soon to be released) has Brouwer’s 10 later studies later Nuevos Estudios Sencillos studies. During 2016 Brian had a somewhat unusual chance to record Joaquín Rodrigo’s Concierto de Aranjuez. An orchestral version minus the guitar part had been brought out on cd and Brian seized the opportunity to record this piece. A video recording of this project is available to view on his YouTube channel. 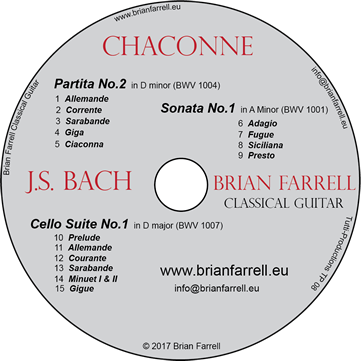 In 2017, Brian released his Chaconne album which contains 3 major works by Johann Sebastian Bach, Violin Partita No. 2, Violin Sonata No. 1 & Cello Suite No. 1. Farrell says I’ve always wanted to record Bach and after 40 years of playing decided maybe nows the time! 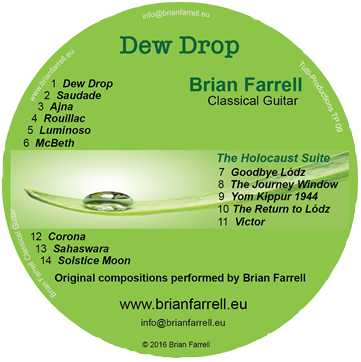 Brian has written a number of original compositions and his first solo album, Dew Drop, has just been released on iTunes and various other digital outlets. It contains his 5 movement Holocaust Suite which was inspired by the story of Victor Breitburg A rage to live - surviving the holocaust so Hitler would not win (Joseph G. Krygier) as well as 9 other works. Brian was presented with a work dedicated to him by composer Dr. Benjamin Dwyer - Four Japanese Prints - for Amplified Flutes and Piano which was given its world première in the National Concert Hall, Dublin with Susan Doyle (flutes) and Izumi Kimura (piano). Recording to date: Luminoso, True Colors, SixDancers, Copper Lines, Sevilla Irena, Chaconne, Dew Drop & The Black Decameron. 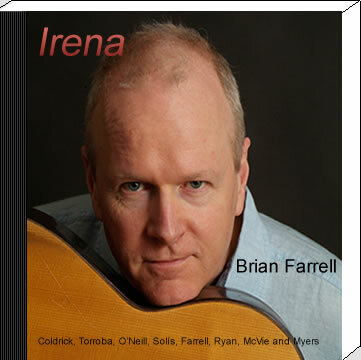 These are all available from www.brianfarrell.eu or any digital outlet such as iTunes, Amazon or CD Baby. 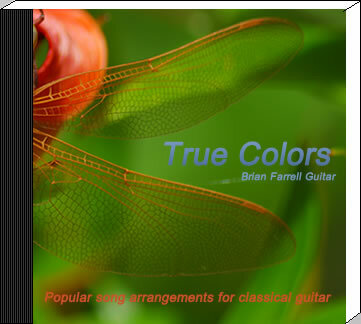 True Colors and Copper Lines contain many of his own arrangements which are also available in score and tablature from his website.